Home history	The most dangerous bridge in Venice? A few people who cross it may notice the four footprints, made of Istrian stone, set into the top level of the bridge. This marks it out as one of the bridges where games known as the verre took place. These were violent competitions between the two factions of Castellani and Nicolotti, ancient divisions to which all Venetians adhered. They would be held, usually on Sunday afternoons, during the Carnival, festivals, and even during visits to Venice by important dignitaries. The verra on the Ponte Santa Fosca by Gabriele Bella, now in the Fondazione Querini Stampalia. The Istrian stone footprints on the bridge. The other bridges are the aptly named Ponte dei Pugni (Bridge of Punches) in San Barnaba and the Ponte de la Guerra (Bridge of War) in San Zulian, and also the Ponte dei Carmini, near Campo Santa Margherita. The details of the fights differed from bridge to bridge, but the one at Santa Fosca involved the two factions beating each other with sticks as they tried to push as many of the opposition in the canal as possible. These were dangerous games which were not strangers to serious injury. But there is another bloody deed associated with the Ponte Santa Fosca. On the evening of 5 October 1607, Fra Paolo Sarpi, a servite priest, was crossing the bridge when he was set upon by men who attacked him with stiletto knives. Assuming the deed was done, the attackers fled north to the Sacca della Misericordia where a boat was waiting to take them to safety in Rome and the protection of the man who is supposed to have ordered the assassination: Pope Paul V. Sarpi had been the leading advisor to the Republic of Venice during a fierce dispute with the pope which had been resolved in April 1607, mostly to Venice’s benefit. Sarpi lived to tell the tale and proudly wore black patches to hide (or advertise) the two scars on his face where one of the stilettos had entered and left his head. He died on 15 January 1623 after a lifetime of service to the Republic of Venice. His dying words were esto perpetua, ‘may she (the Republic of Venice) live forever’. Sarpi with his back to the bridge. In the 19th Century, a statue to Sarpi was erected in the Campo di Santa Fosca, outside the church, with his back to the bridge. It can still be seen there today. Don’t worry the next time you are passing Santa Fosca though. 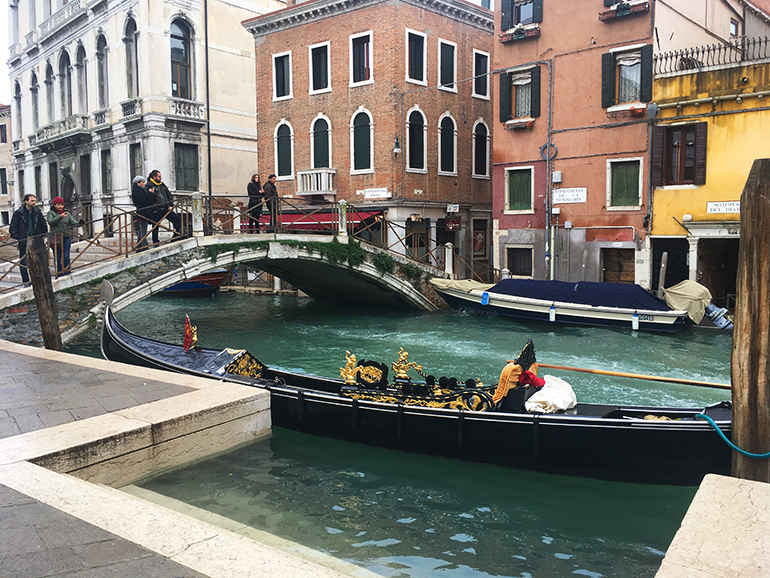 Like most places in Venice, today the bridge is very, very safe. Which is your favourite bridge in Venice?